If you’re a beauty blogger, you probably know and love Sephora. In fact, I don’t think I know a single beauty lover who isn’t a Sephora fan (myself included). From a business perspective, they’re genius. Always on top of trends, always offering new brands and services, and always coming out with cool new technology. This is why they always seem to dominate the beauty space. So where they’re going – you want to be. And that is where the new Beauty Insider Community comes in – it’s a hidden traffic source just waiting to be tapped. 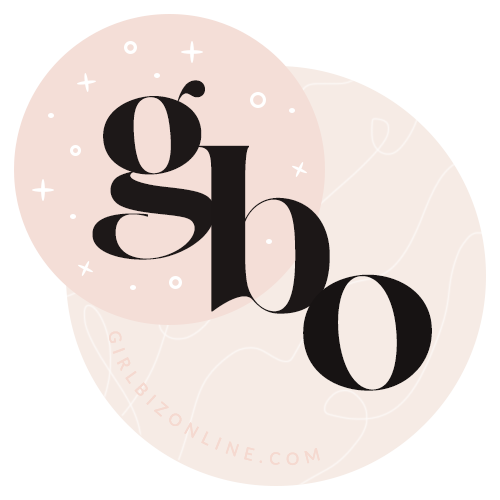 Seriously – it’s like Facebook for beauty lovers and, in addition to being fun, its a new tool that you can use to build your following and get traffic. 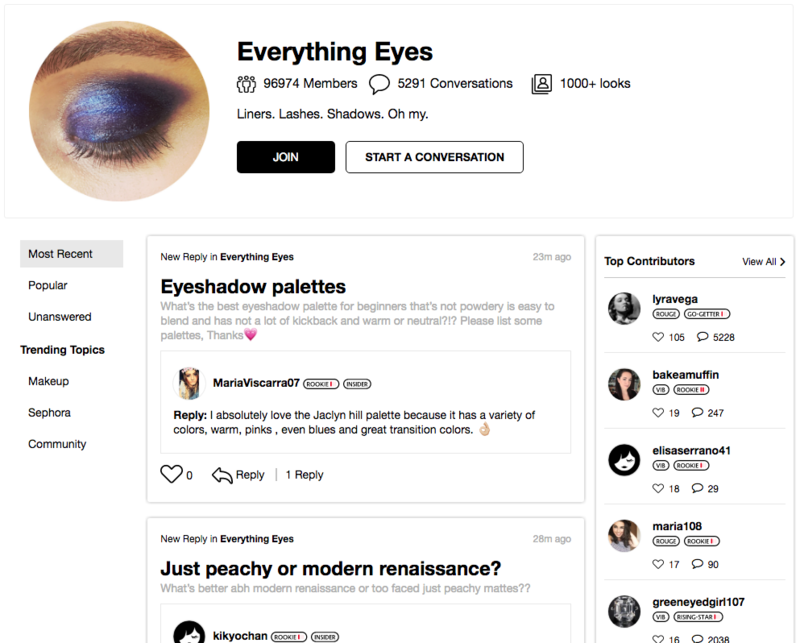 Why you need to be hanging out in Sephora’s new online community. Why this traffic can be so valuable. What you need to do to see results. If you’re a beauty blogger, you need to be using it. Let’s go. The new Beauty Insider Community is a whole new element that you should be taking advantage of. It’s a new way for people who love beauty to connect, to talk products, and to learn new tips and tricks. 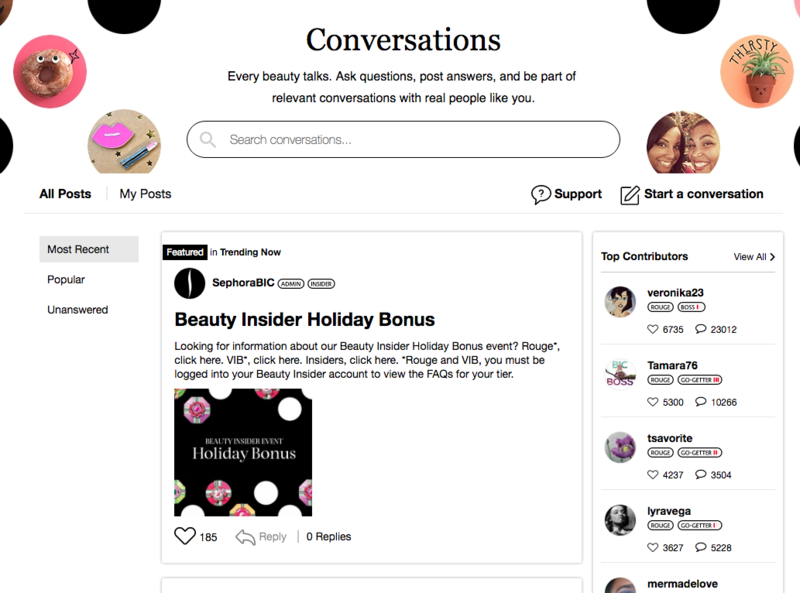 There is even a live chat feature, where you can chat about products with other beauty lovers – in real time. It is a really cool place for beauty bloggers to get new followers. How? By engaging with other users, sharing their knowledge, and promoting their blog. 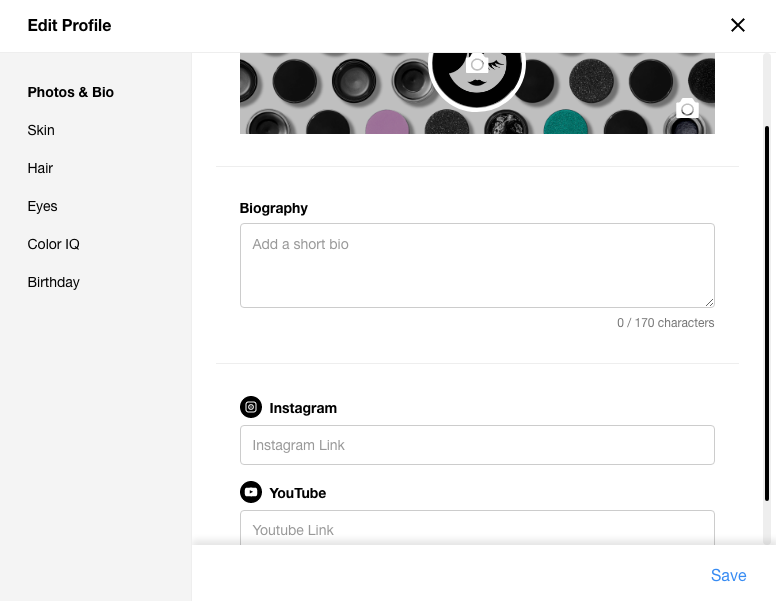 your profile – which highlights everything you post, your best photos, and a bio where you can talk up yourself and your blog. People can also follow you right in the platform, which means they will continue to see your content. It’s important to be active! groups – join groups based on different beauty interests – skincare, eye makeup, etc. Then interact with the community, prove you know your stuff, and talk up your website only where appropriate. conversations – participate in conversations about certain topics. The more good answers you provide, the more likely people are to remember you, click back to your profile, and get over to your blog. gallery – looks live here. If you do a great makeup look, you can upload it to a group or just to the looks gallery. This is a great way to get eyes on your work because beauty lovers also love photos of anything beauty. If they like what they see, they’re likely to find you on Instagram or your blog. Almost every participant is a rouge or at least a VIB. Most of the people who are active in this community are Rouge or VIB level members. If you’re not familiar with the Sephora-language, this means that they’re people who spend money at Sephora – and sometimes it’s a lot of money. VIB’s must spend at least $350 at Sephora in a calendar year and Rouge’s spend $1000+. These are people who really like beauty. They’re probably talking beauty on every channel – Facebook, Instagram, and now – Sephora. So you already know that a lot of this audience are beauty-obsessed and interested in your content (plus, they might be willing to buy through your affiliate links). You know these are people who want to participate online. How? Because they already are. These are people who like having online conversations on beauty, they’re checking back to their beauty sources and interacting with content. They’re spending money in this world. These are your people. This is your dream audience. You’re able to build relationships. Most traffic sources won’t bring you a huge audience and 1000 email subscribers over night. It’s not because the sources aren’t good – it’s just not how people work. One impression isn’t usually enough to create an avid reader or email subscriber. You need to let them know you exist and then convince them that you’re the right source for them to visit. This new platform is a really good place for you to build that relationship. You show your skills and knowledge, you help them out and share your personality, and as they keep seeing your name and face pop up again and again, you start to build a following that relies on your advice. These could be your dream readers. You need to hang out where they are. It’s that simple. 1. Create a captivating username and bio photo. Eye makeup photos. People love close-ups of beautiful eye shadow looks. Do something trendy and bold that makes people feel the need to see more. Make your username your website name – the more people see it, the more likely it is to make an impression in their minds. 2. Write an awesome bio and include your website or social media handles. Sephora is encouraging social sharing – they want you to link your Instagram and YouTube profiles so do it! Take advantage of all of the space you have to let people know about your blog or biz in the biography section. There would be nothing worse than someone wanting to see more from you and clicking on to your profile – only to see that it’s bare and they have no idea where else they can find your stuff. Make sure this is filled out to convert! Pro-tip: talk up SPECIFIC things people can find on your blog. If you offer a freebie, mention it! If you have a great guide or blog post, link it. This helps to give people a concrete reason to click – and they’re more likely to do so. 3. Post lots and lots of photos (and use a watermark with your website name). Beauty, obviously, is very visual. Photos make a big impression and the new community gives you tons of chances to show your photos off. You can upload different “looks” that will show up on your profile and in the gallery – plus you can tag them with items to show people what you’ve used, like a specific foundation or mascara. This feature is especially awesome because, when you tag an item, your photo will actually show up on the item page! Anyone shopping that product can see the looks in the review area – and is likely to see your photo. It’s an awesome opportunity to get yourself seen – even by people who aren’t members of the community. I can’t stress enough how AMAZING this is. It’s like Sephora is actually giving you ad space on product pages that get viewed hundreds, if not thousands, of times a day. Pro-tip: Put your website or social media handles on your photo where someone won’t need to click to see it. This way, if they want to see more, they already have your social handle. A square shaped image is best for this so that the words don’t get cut off when the image is shrunk down. This way people can easily know where to go if they want to see more from you. You can use Canva to really easily add text to your photos. Make sure it’s a decent size and that the color stands out enough so it can be read when the photo is small like these! I think groups are one of the best parts of the new community. This is your opportunity to connect with beauty lovers and to prove that you know your stuff. Join groups based on your interests and be active within them – share looks, join conversations, answer questions. If you can prove that you’re knowledgable in a group and establish yourself as an authority, you can use this leverage to get more website traffic. If people keep seeing your name and photo providing great value, they’ll start to recognize you and follow you. Pro-tip: Sephora has also put in lots of little features that help knowledgable people shine. The most popular answer gets featured under the question and see that Top Contributors section on the side? By being active, you can wind up here. If you can get yourself listed, you could get a lot of views on your content. Providing value is HUGE. Conversations are similar to groups but are slightly different. When you’re on the conversation page, you have the chance to answer or join in on any topic. You should be using both, because there is another chance for you to show off your skills and possibly snag a Top Contributor spot. Make a commitment to spend even just 10 or 20 minutes participating in the community each day and I bet you will start to see traction! Sephora is making it really easy to share your stuff – including the option to upload your YouTube videos directly to the Looks Gallery. 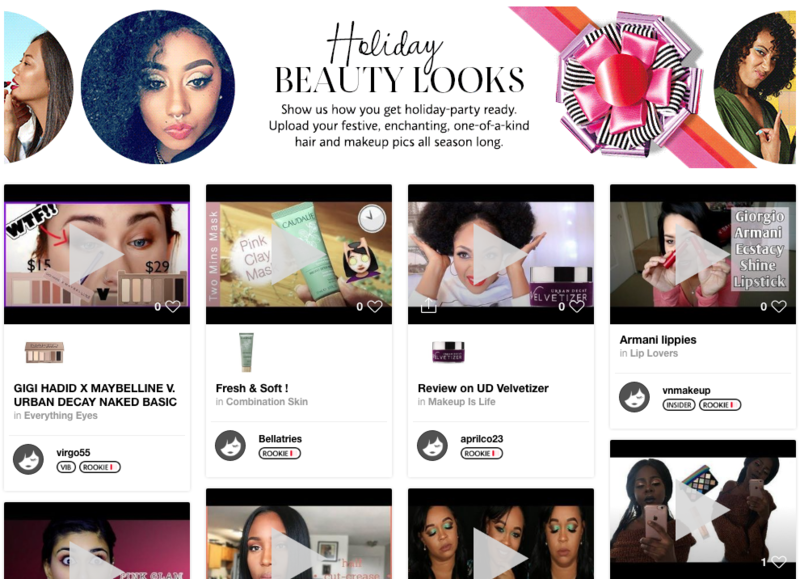 Video is a really awesome format for anyone in beauty because it’s so visual – people LOVE watching makeup tutorials and it provides so much more value than photos alone. Plus, since less people use video, your content is more likely to stay on the front page for longer. Pro-tip: When leaving looks, either photo or video, PLEASE take advantage of the description space. Provide value, link back to your blog, be engaging and funny – it doesn’t matter. Just take advantage of the space you have to use. There are so many looks that lead to nothing when clicked on. ‘Fall smoky eye’ is not going to cut it. If someone likes your look enough to click it, link them to a blog freebie or blog post – “see more photos of this look on my blog!”. Do something to keep them engaged. Reviews are essential because it’s a way that you can also be seen by people who aren’t apart of the Sephora community. Most people who are considering a product are going to want to read the reviews – and your profile can show up here! That’s lots of eyes on your words, so make them count. Leave something detailed, educated, informative, and helpful – people will be appreciative if they can get a real answer. By having your username as your website name, or leaving a quick link to your blog, you can convert your review readers into blog readers! Pro-tip: Leave part of your review on Sephora and then link to your blog where you have a full post up. Just remember to give them a reason to click. You can’t just say “read the rest here”. You want to leave them on a cliffhanger or let them know exactly what more you have to offer. Try something like “see before + after photos on my blog – you won’t believe it!” or “I did a tutorial with this palette if you want to see the pigmentation and how it applies!“. Again, this isn’t overnight traffic. But this is a place where you can connect directly with your dream reader and prove that you know your stuff. Beauty bloggers, this is crucial. Sephora is handing you the opportunity to connect with to your dream readers – you would be crazy not to take advantage. Yay, thanks for your feedback ❤ I can definitely put something together on that – I agree it would be really helpful! What a great idea. I never had a clue about this and I love Sephora. Thank you! 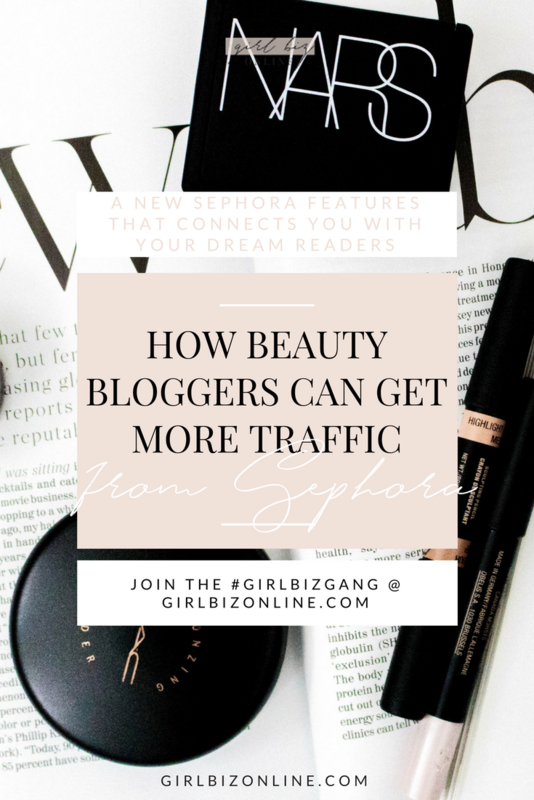 I know – it’s such a good tool for anyone who blogs beauty. An awesome way to get in front of their dream readers 🙂 Thanks for your feedback!